My dude is seriously not messing around. He recently came home with a lovely Le Creuset braising pan. Despite being stoked at the possibilities of braising ALL THE MEATS, I did have a little fear this lovely pan may find its place next to the tortilla warmer thingie and the quick marinating gadget that are at the back of the cupboard coated in dust. But sir Dave proved me wrong right away, wanting to cook me a big dinner by getting his braise on. I came home to the yummy meal below and couldn’t have been happier – it was super flavorful and falling off the bone, awesome recipe. Heat oil in a dutch oven or large, heavy covered pot over high heat. 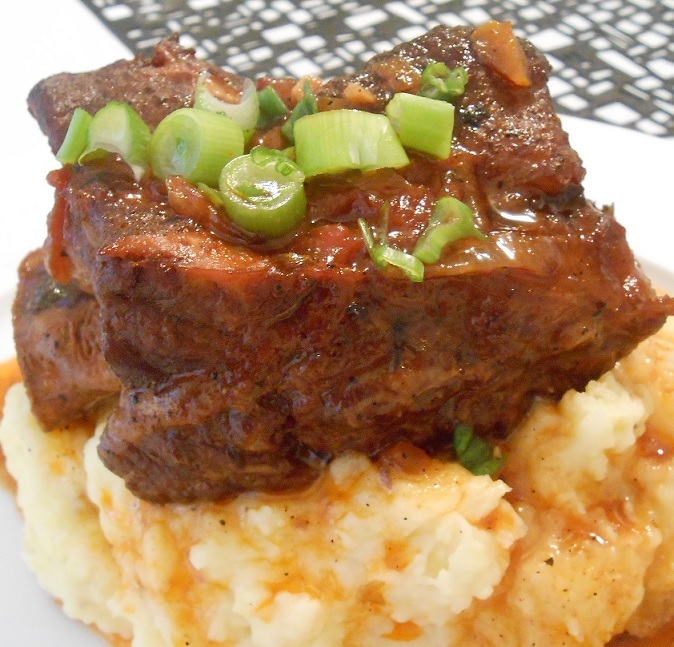 Season ribs with Creole seasoning, patting it in well with your hands. When pot is nearly smoking add ribs without crowding them and sear on all sides until they form a brown crust. Do this in batches, if necessary. 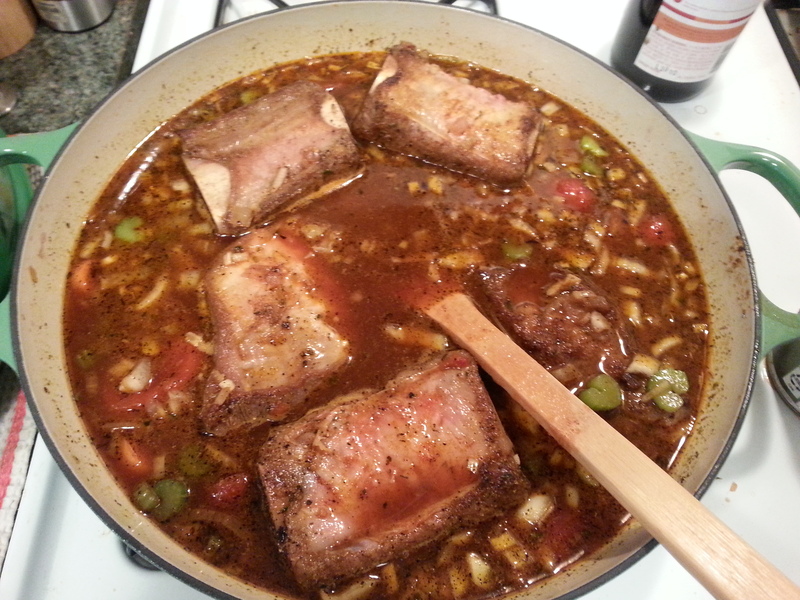 When all ribs have browned, add onions, celery and carrot; saute 1 minute to brown lightly. 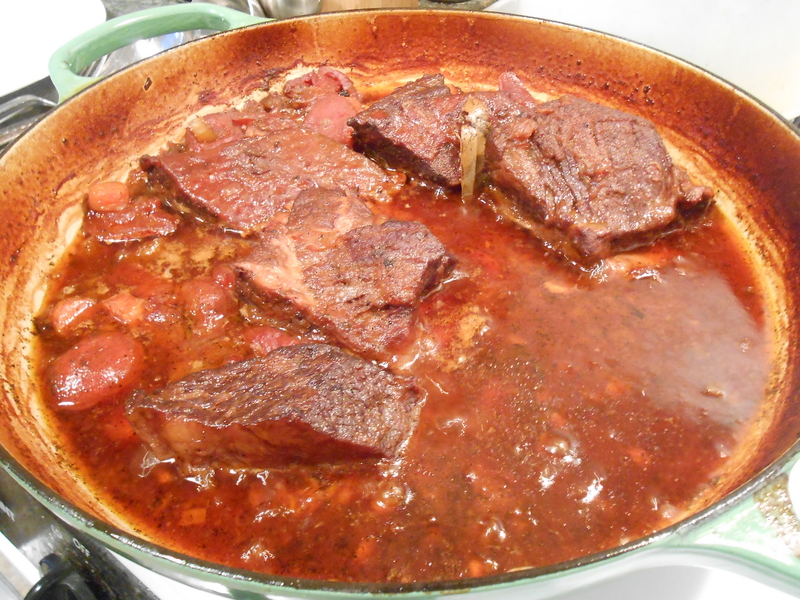 Stir in tomatoes, garlic, vinegar, Worcestershire sauce, bay leaves, pepper and enough broth to just cover ribs. Bring to a boil, reduce heat to gently simmering, cover and simmer until very tender (Dave did this in the oven) about 2 1/2 hours. To serve, mound ribs in center of 4 plates, spoon sauce over and garnish with chopped scallion. The original recipe came from Emeril Lagasse with a couple of tweaks, you can find it here.